First Line:"I'm afraid," said the little girl sitting on the bed." Review:This trilogy has seriously touched my heart in ways no series ever has. I cried, I laughed and oh man by the time I was done reading it I was just left heartbroken and happy all at once. I never even knew it was possible to feel those two things at once until I finished reading Clockwork Princess. Jem...Will...Tessa their love story was just perfect on an epic level. If you want to talk about the best love triangle ever written theirs was it. Clockwork Princess was an amazing ending to an excellent series. 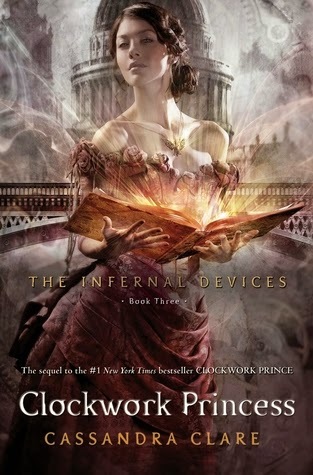 The Infernal Devices is by far one of my all time favorite series. I loved Will and Jem. There friendship was just so beautiful and what they had to endure it just broke my heart. I have read so many books with love triangles with many where they are just incredibly annoying and a few that were done just right and then there is Clockwork Princess the love triangle in this book was just pure perfection, and the way it ended a part of me is still just so sad thinking about it but happy too...I'm just a bag of emotions really when it comes to this series. I know I will re-read the Infernal Devices again but I'm not sure if I will survive through the gut-wrenching moments that came with it all over again.